Just a quick picture of my very classic American dinner. I know I’ve said it before. Nothing makes me happier than a slow cooking meal. A huge hunk of tough meat is made tender and delicious by hours of low heat and spices. 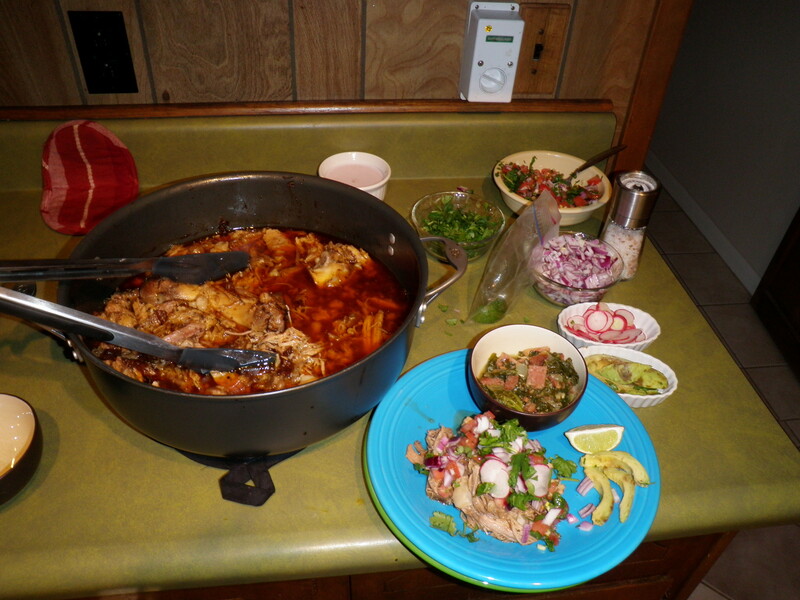 Carnitas is a favorite in our house. We love to make tacos from it, but considering that the tortillas are a nono we will stick to only the meat today. 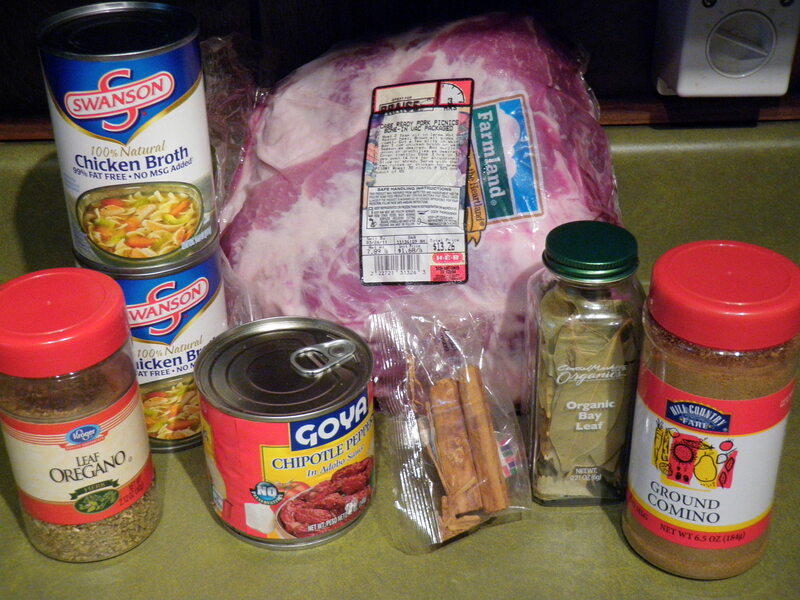 One great benefit of this meal is that the meat is generally pretty cheap per pound and it yields a ton of leftovers. I like to make this on a Sunday so I have lunches for most of the week. It is not a hard meal to cook; throw everything in the pot and walk away. Cook the bacon rendering the fat. If you do this in a deep pot you will only have one dish to clean. Pull out the bacon pieces, leave the grease, and turn up the heat in the pan. Brown the shoulder on all sides. Add all ingredients including bacon bits and cover. Cook low and slow. If you have small children you may want to consider putting this in the oven (oven safe dish of course) for the cooking time. Keep the pot on low heat (200 in oven) and leave it alone. Go to church, walk the dogs, mow the grass, whatever it is you do on a lovely Sunday like this one. Cook for about 6-8 hours. Check the meat. If it is fork tender it is done. That means you can put a fork in it and pull the meat apart easily. Shred it with forks and put back into the juice until ready to serve. 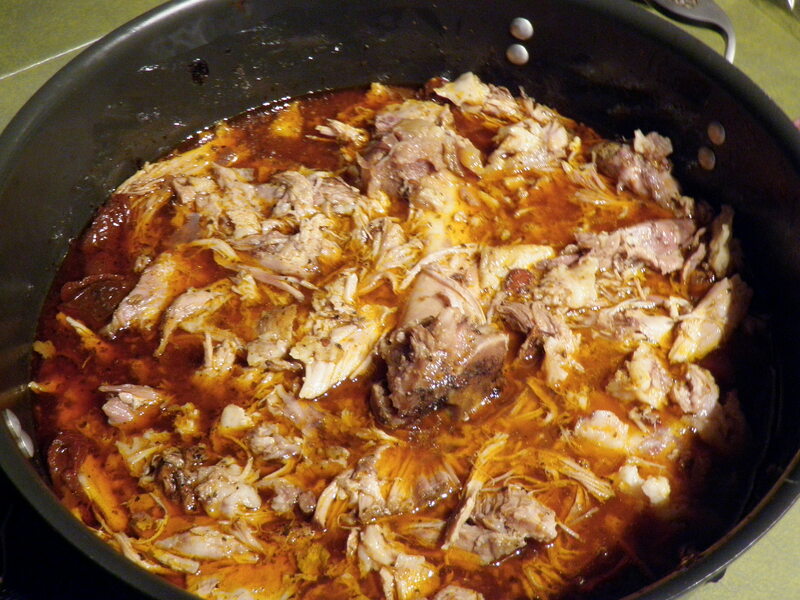 Traditional carnitas is fried in the fat that renders making it a bit crispy. Tonight I just wanted to eat it straight from the oven as is. You can serve this with some fresh cilantro, lime, avocados, radishes, and pico de gallo for true authenticity. 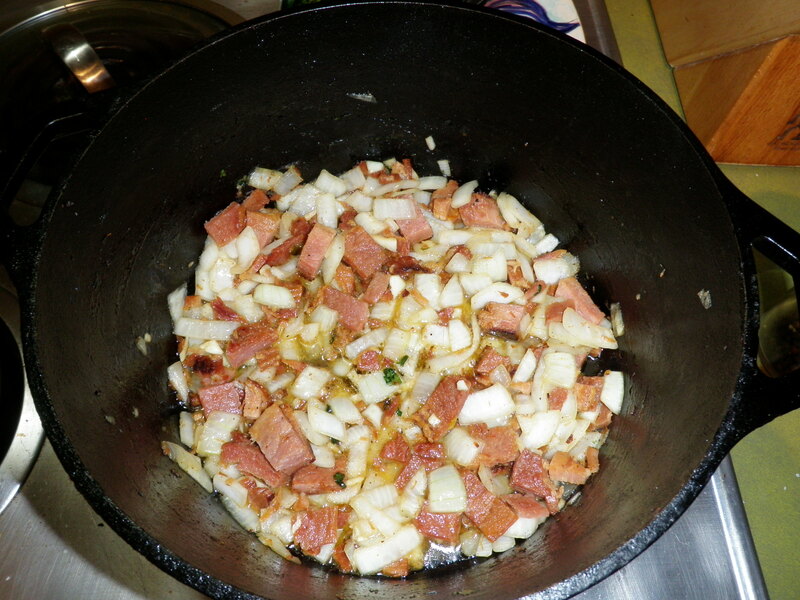 Pico is just: tomatoes, onions, jalapenos, diced, squeeze of lime, a sprinkling of salt and pepper. For lunches through out the week I’ll use it as a salad topper or in my eggs at breakfast. It is a delicious meal that is pretty effortless. Who doesn’t love ice cream? This recipe has developed over time. Originally it was just frozen mashed bananas. I think it it is a little more sophisticated than that now. 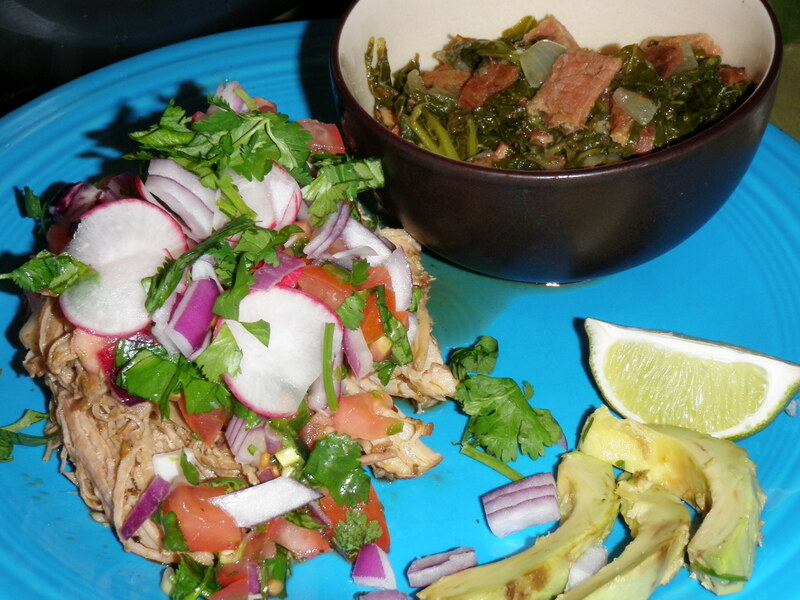 Its very tasty, easy, and paleo! If you have a person in your family that is lactose intolerant this is also a perfect alternative. 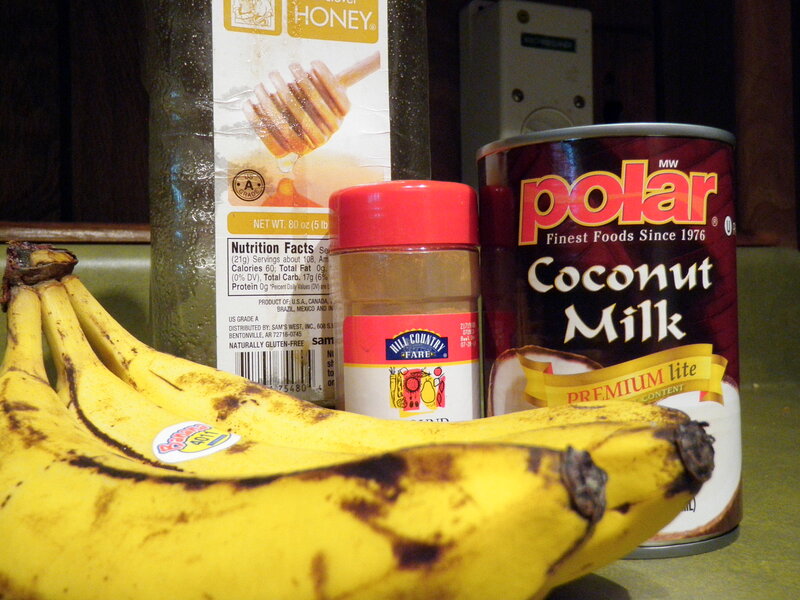 The best bananas to use for this are the ones that have been sitting on your counter for awhile. The ones you’d normally turn into banana bread before you stopped eating grains. 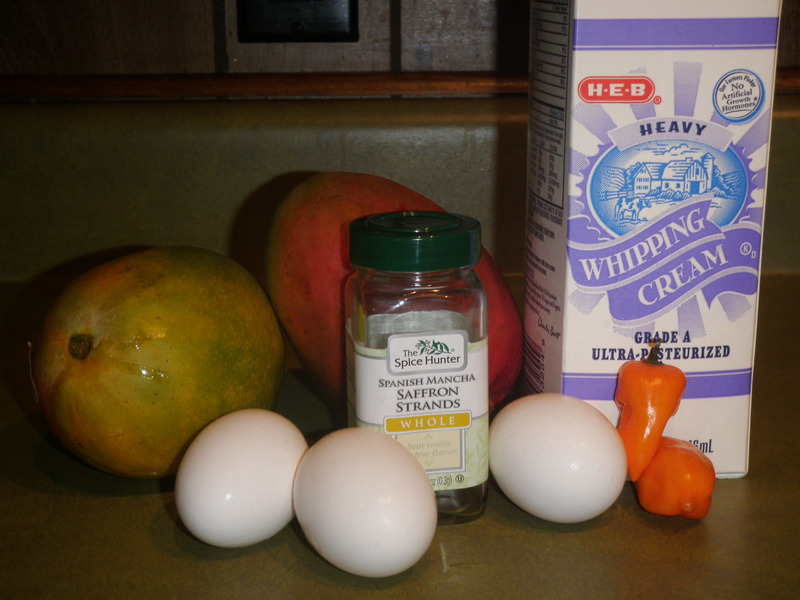 I brought this to a friend’s house for dessert and served it with some lovely papayas. The are a large tropical fruit. On the outside they look green and yellow and almost like a mutant pear. They weigh upwards of 3 lbs each. Inside they are a gorgeous pink/orange color and have seeds that you have to scrape out before you eat it. The flavor is a mild . T says it tastes like a strange cantaloupe and I’d have to agree. Go ahead and try one if you’ve never had it. I doubt yo u’ll be disappointed. 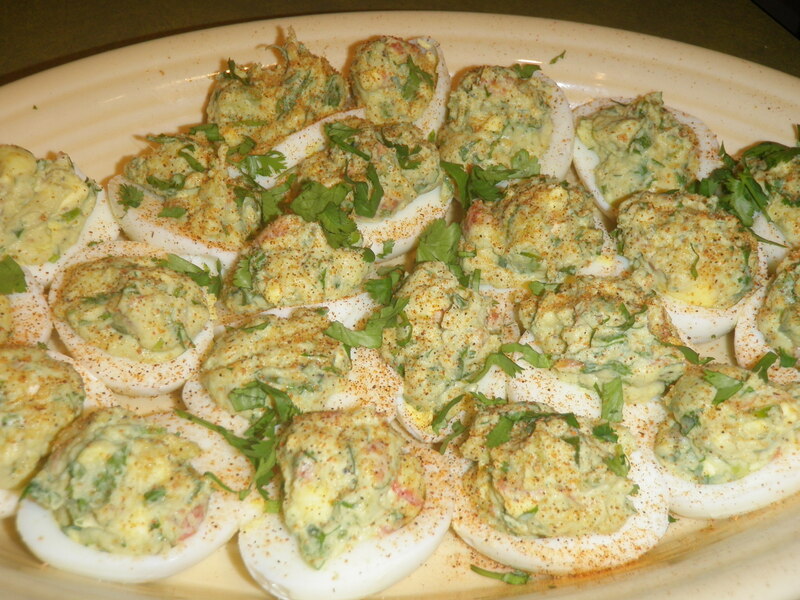 I saw a recipe for guacamole deviled eggs recently on sweetcheeks‘s site. I modified it a little but the idea remains the same. I thought that two perfectly wonderful foods put together was a fine idea. I was happy that I tried this one out. The only thing I would change is getting fresh tomatoes. I totally forgot to pick some up so I used canned instead. 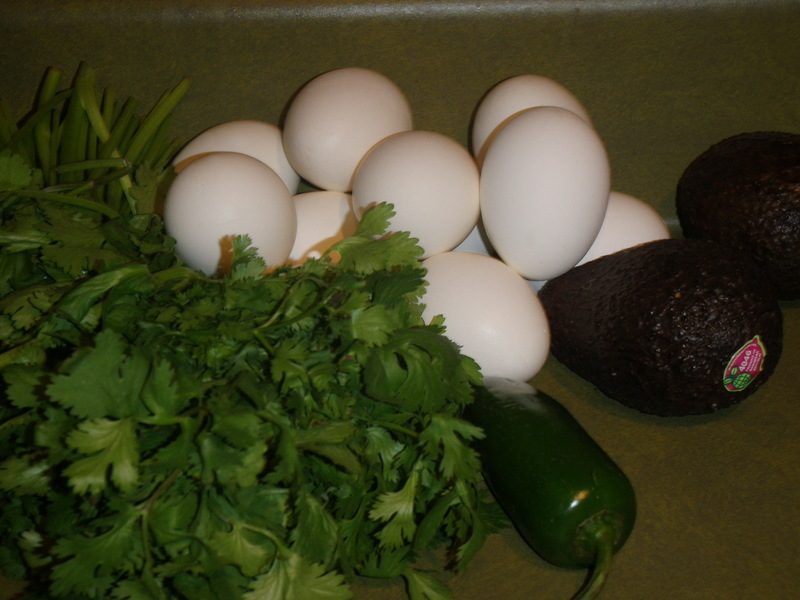 Hard boil your eggs, peel them and slice them in half lengthwise. 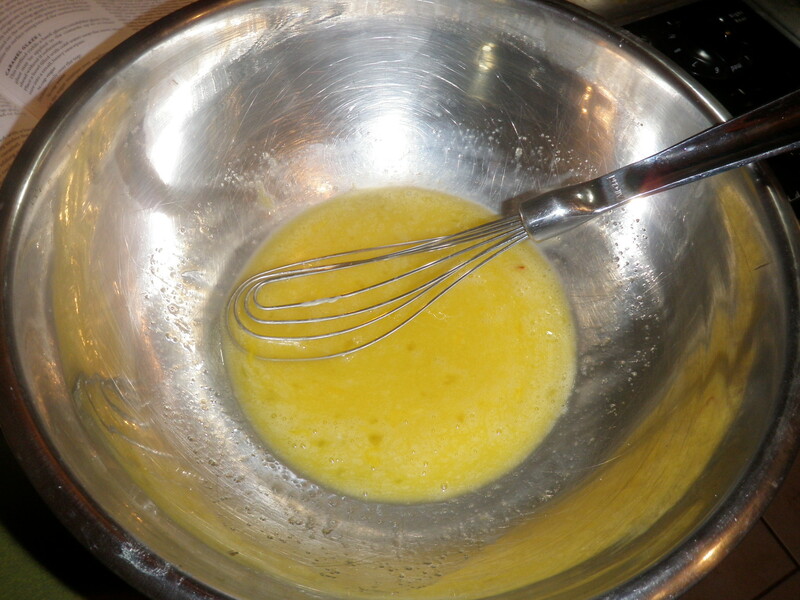 Remove the yolk into a mixing bowl. I find that a slight pressure to the back as if I’m trying to turn the egg inside out just pops them out easily with no mess. Add all ingredients except the seasoning to the bowl. Mash it up good. Get your anger out it’s okay to abuse the yolks. Scoop the filling into a sandwich bag and cut the tip of the bag off. Use this to pipe your filling into the eggs. I’ve never tried this before and I’m sad that I waited this long to try it out. It makes life so much cleaner and easier. Dash some seasoning and sprinkle some cilantro on the top and enjoy. T invited a classmate over for dinner this weekend. 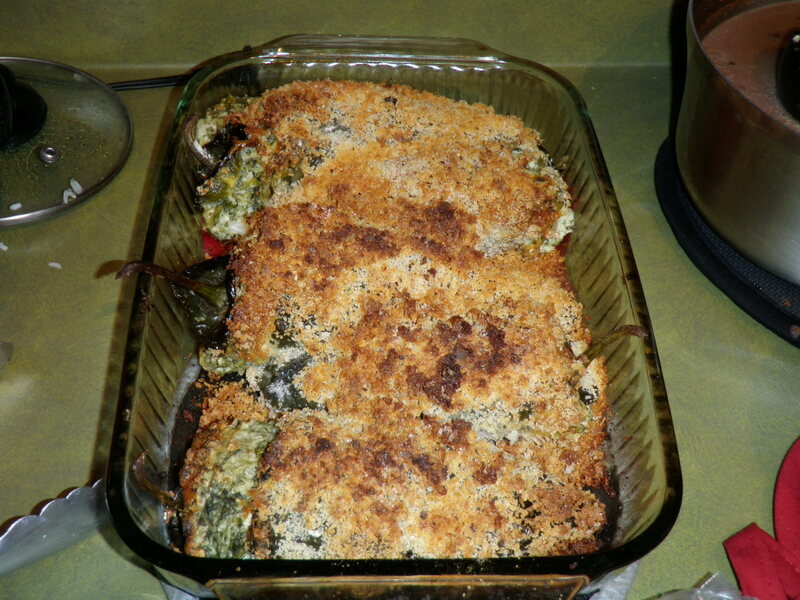 We cooked a delicious vegetarian (un-paleo) meal. She even wanted to help out! Dinner was “amazing” and the company was wonderful. This meal was not a paleo meal but It could definitely be modified to make it that way. 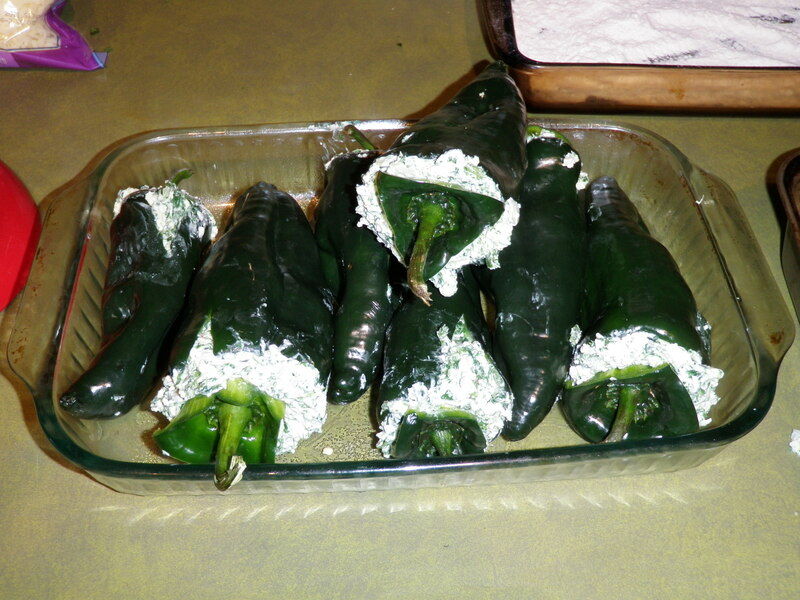 I will cook some other variations on this because it was super tasty and I love the flavor of a poblano chili. 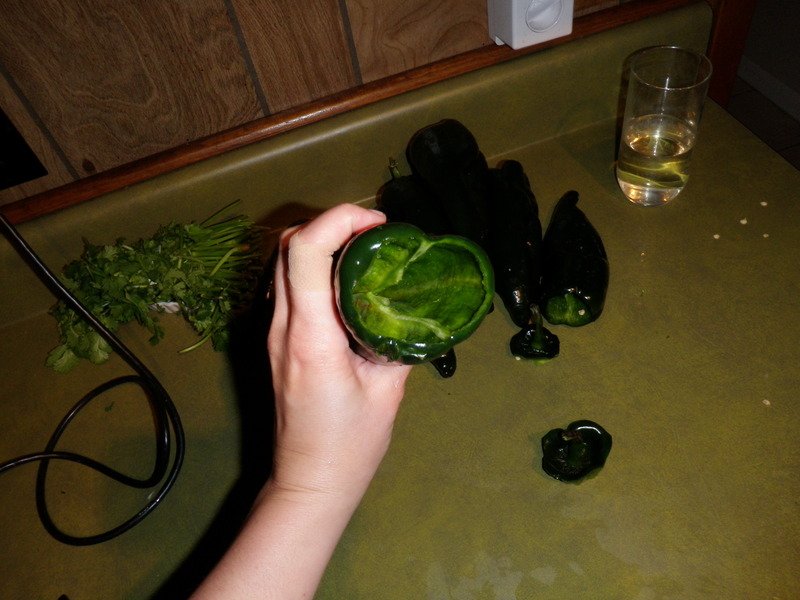 Carefully slice around the stem of the poblano peppers as if you were making a jack’o’lantern out of it. Seed and core the inside with a spoon being careful not to rip the pepper. 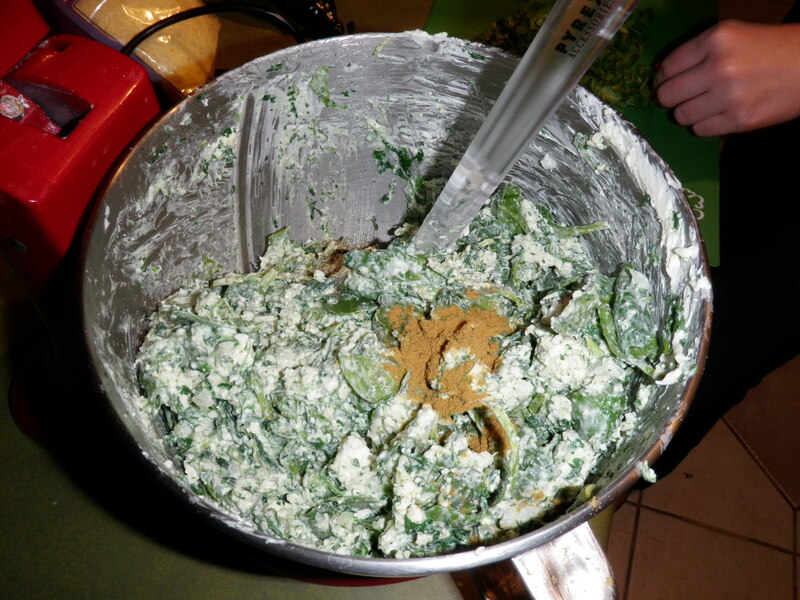 Mix all the cheese, remaining veggies, and spices in a large bowl. 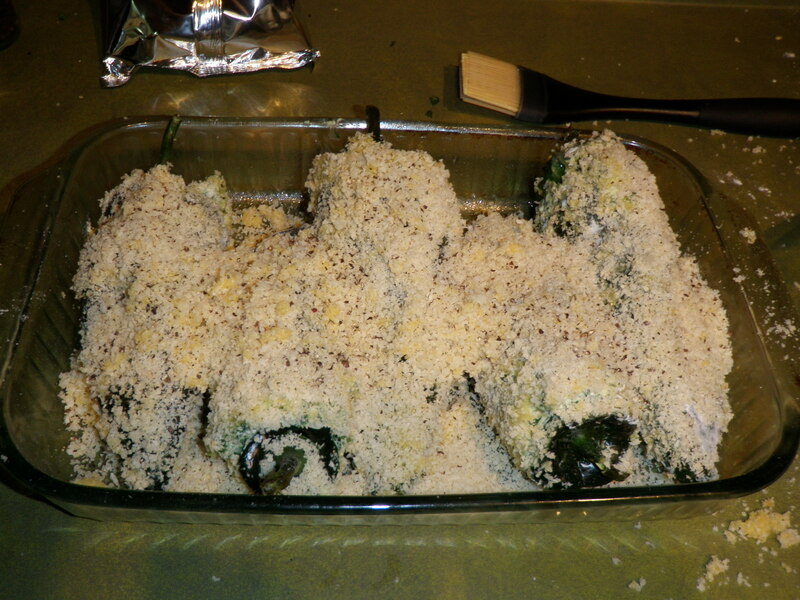 Spoon and press down the cheese mixture into the poblanos. We ended up with a lot more cheese than peppers so I’ve adjusted the number of peppers you’ll need above to match what we made. Stick the tops back on after you’ve stuffed the peppers. 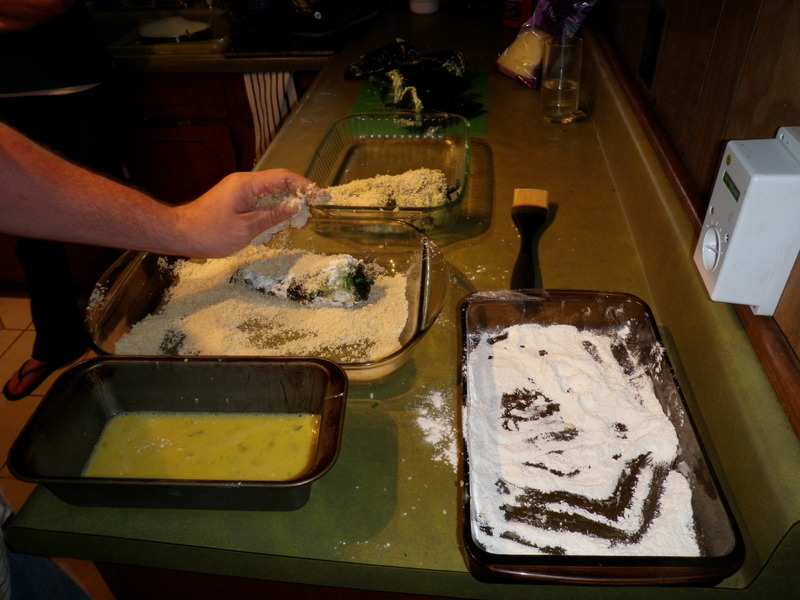 Make a breading station to bread the peppers. 1. egg wash of beaten eggs, 2. flour, 3 panko. 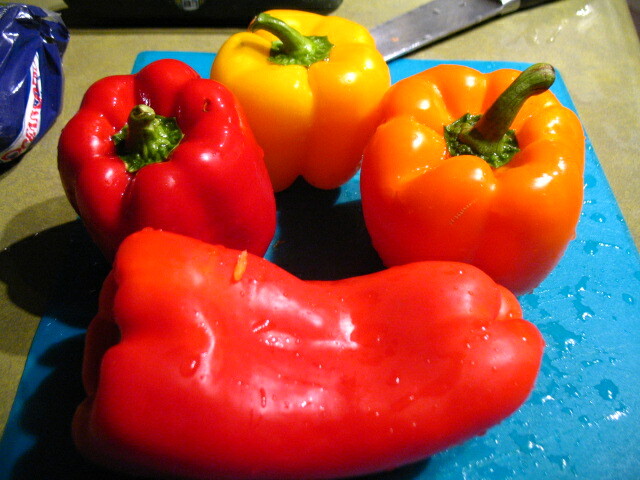 Dredge the peppers through eggs, flour, eggs, then panko. If you are eating more paleoish (cheese is not really paleo) you can omit the breading steps and your peppers will still be delicious. Bake in a large baking tray for about 30 minutes at 350. 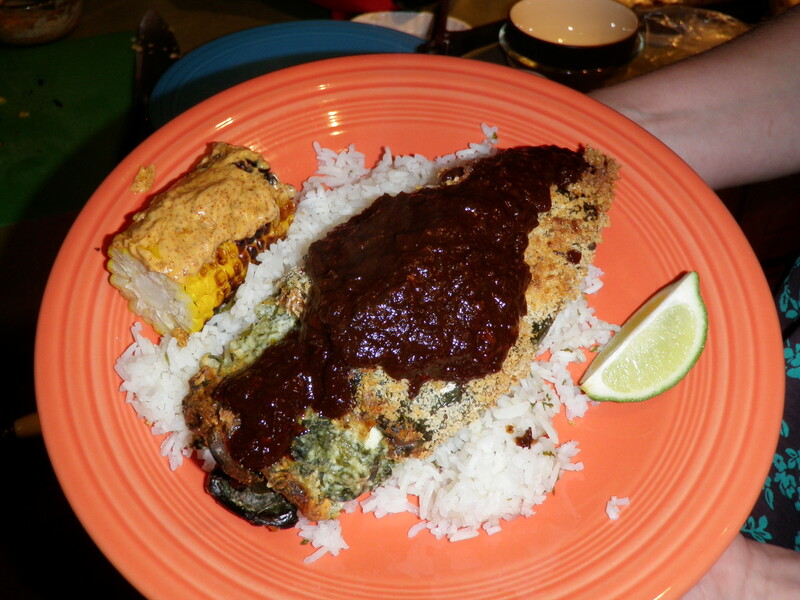 We made a mole sauce to put on top of these sort of enchilada style but your favorite enchilada sauce will work too. Mole (mole-ay) is a pepper chocolate sauce that is super tasty. The recipe we followed was fair but there are better ones out there on the interwebs or you can find it pre-made in the Mexican section of your grocery store. 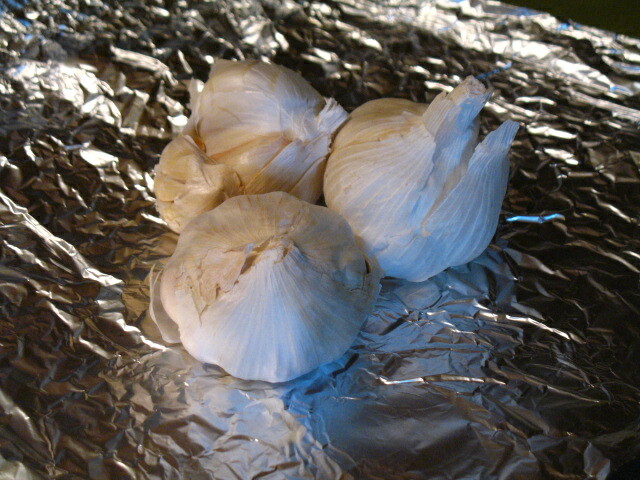 Cook the onions and garlic first until clear, add the rest of the ingredients simmer until meal time. About 10 minutes. 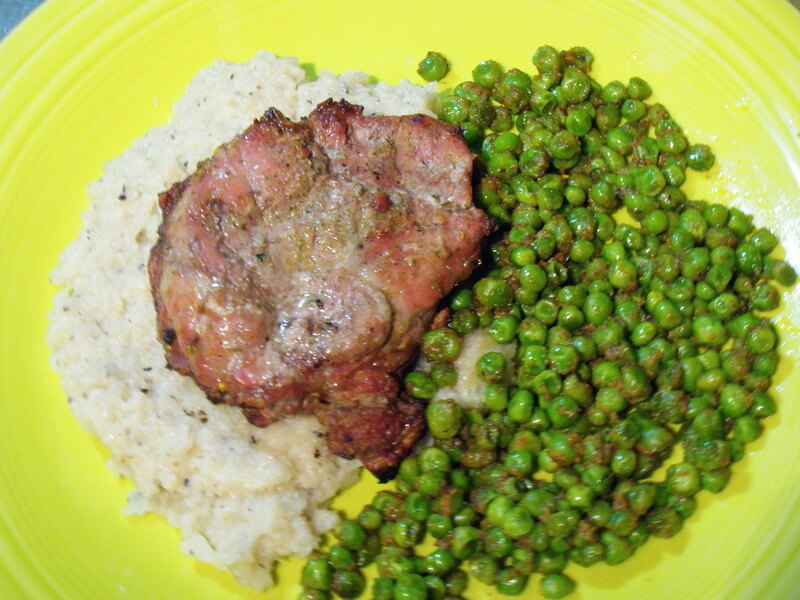 Again legumes are not paleo. However, this would make a fun cheat meal that you can involve the whole family in. 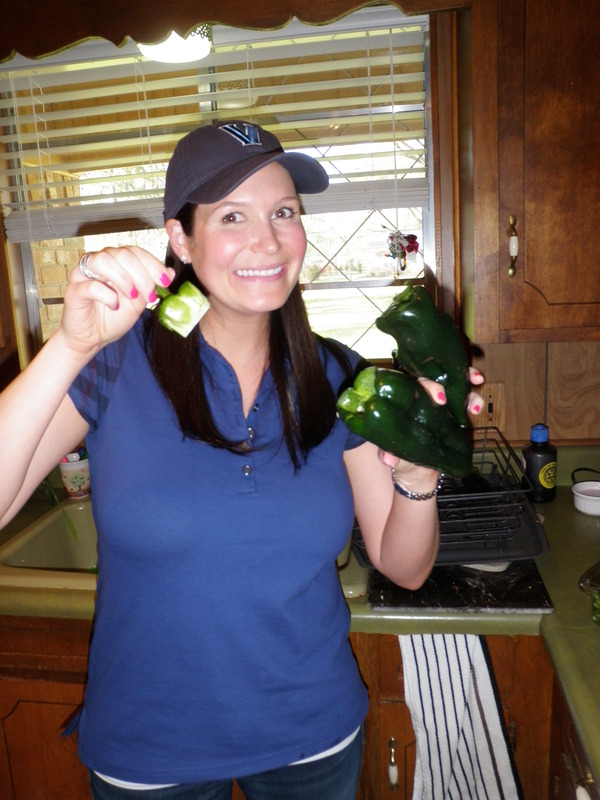 We really enjoyed dinner and it was fun to have Bethany help out! 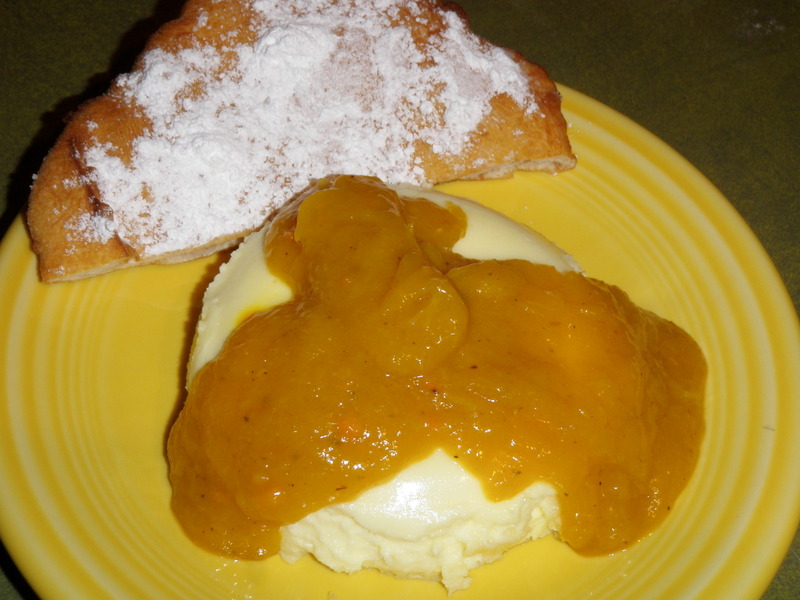 Since my first two color recipes were savory and entree type dishes I thought it was time for a dessert. T and I threw around a lot of ideas for yellow. Eventually we settled on a sort of creme brulee. This is a modification on a super easy and delicious creme brulee recipe that comes from The Joy Cooking. The recipe uses saffron. It is always an experience buying saffron from the grocery store because the clerk rings up a tiny mostly empty bottle that costs a ton. They give you this look like you are crazy for having purchased an empty bottle for so much. Little do they know the joy of saffron. Saffron is the stamen of a crocus flower. To harvest it you need a small army of people who can work quickly. It must be done by hand and in one day or the harvest is ruined. There is currently no way to mechanize this process. This is why a few stamens in a mostly empty jar cost a ton of money. Saffron imparts a very subtle but distinct taste and smell to foods along with an amazing yellow color. It is that flavor on the back of your tongue that you just can’t place but know is amazing. There is really no substitute for saffron in taste. If you want the color you can go with turmeric but in this dessert it wouldn’t work taste wise. 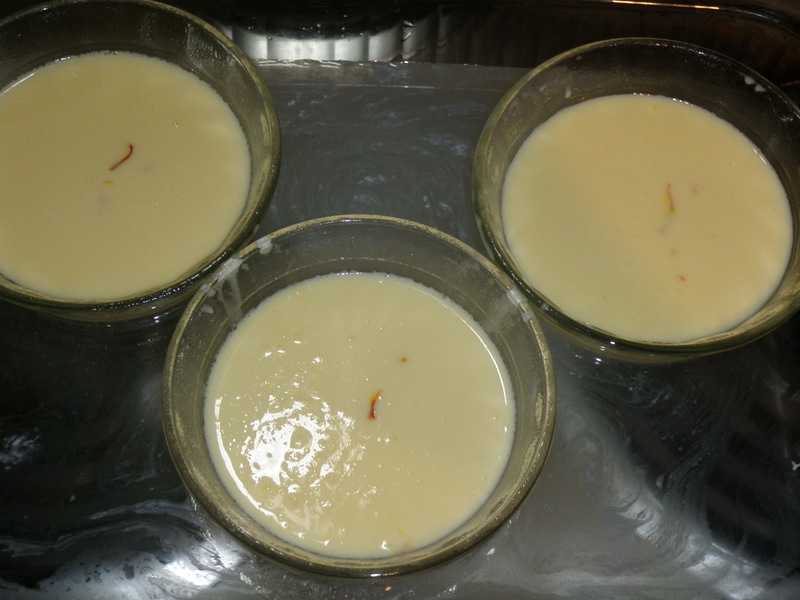 Heat the cream with half of the saffron stirring frequently to prevent boiling over. Mix eggs, sugar and remaining saffron in a separate bowl until just blended. You are not trying to whip the eggs. Just mix them. 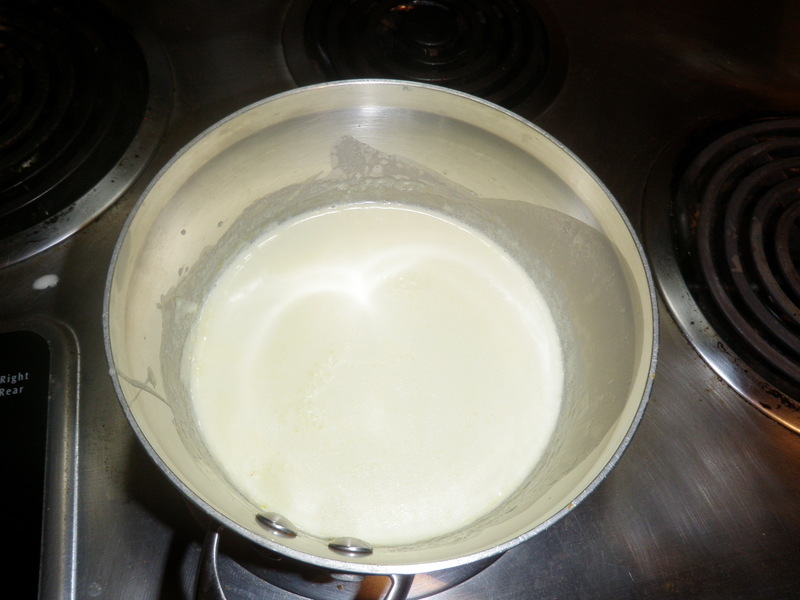 Pour the simmering milk over the eggs very slowly while stirring. It might help to have a friend help you here. What you are doing is called tempering the eggs. You don’t want to make scrambled eggs so you pour very slowly and stir constantly. It brings the temperature of the eggs up with out cooking them. Pour the creme mixture in ramekins sprayed with some cooking spray. 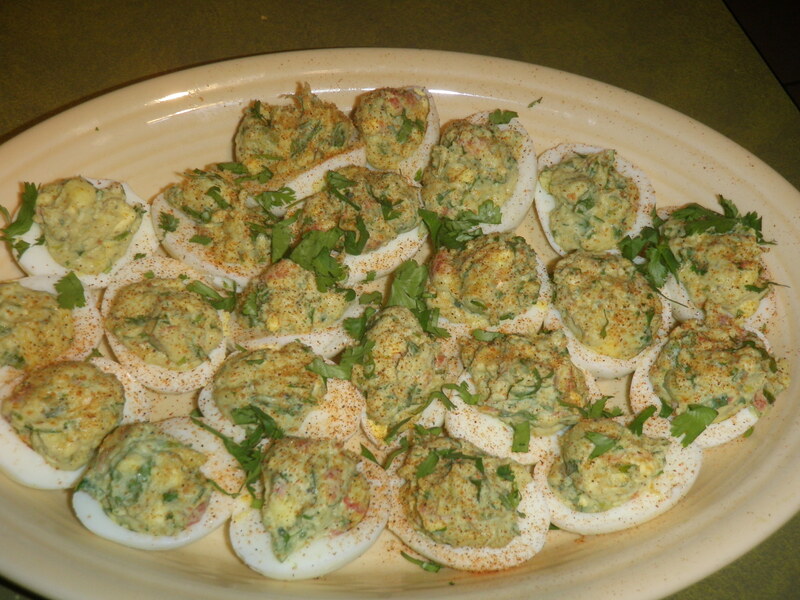 A ramekin is a small oven safe dish. If you wish you can strain the mixture to remove any lumps. The only thing is if you strain it you’ll have to pick out the stamens and put them back in the creme. Place ramekins in a bain marie, or a water bath. What this mean is you place the ramekins in a larger pan filled with water. Be careful not to get water in the creme or it won’t set. The water circulates around the ramekins to cook the creme evenly. Cook at 250 for about 2 hours. The creme will be set but not totally firm when done. 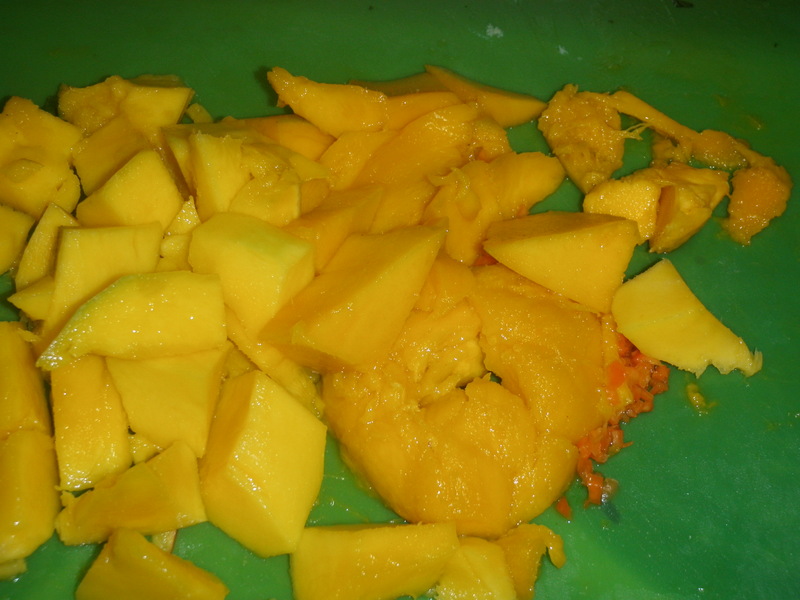 While that sets, peel and seed two mangoes. Rough cut them into large pieces. De-seed and finely mince one habenero. Heat a large pan to super hot. 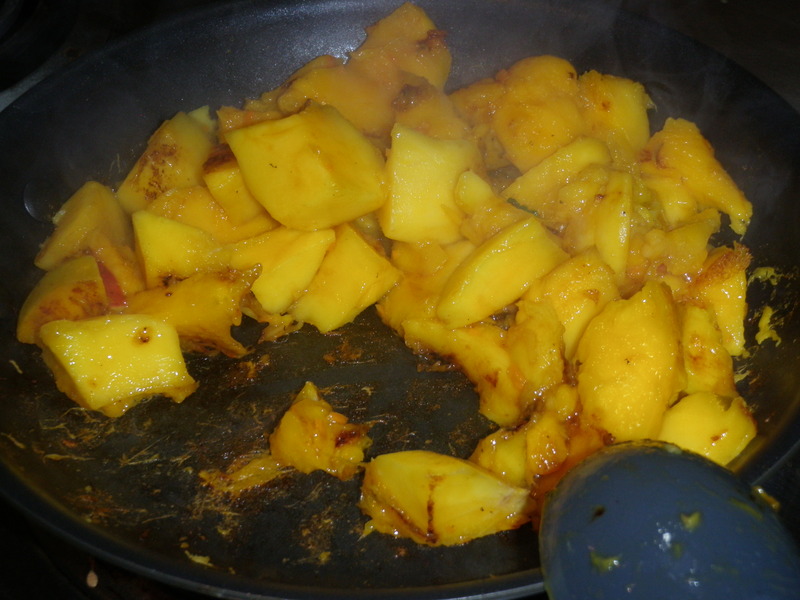 Throw the mangoes and peppers in when the pan is sufficiently hot. Do not add oil or fats to the pan. You want to sear the fruit to start some carmelization. Stir a few times to brown on all sides. This process will put a lot of the habenero oil in the air. (think pepper spray) It will make you miserable if your kitchen is not well ventilated. 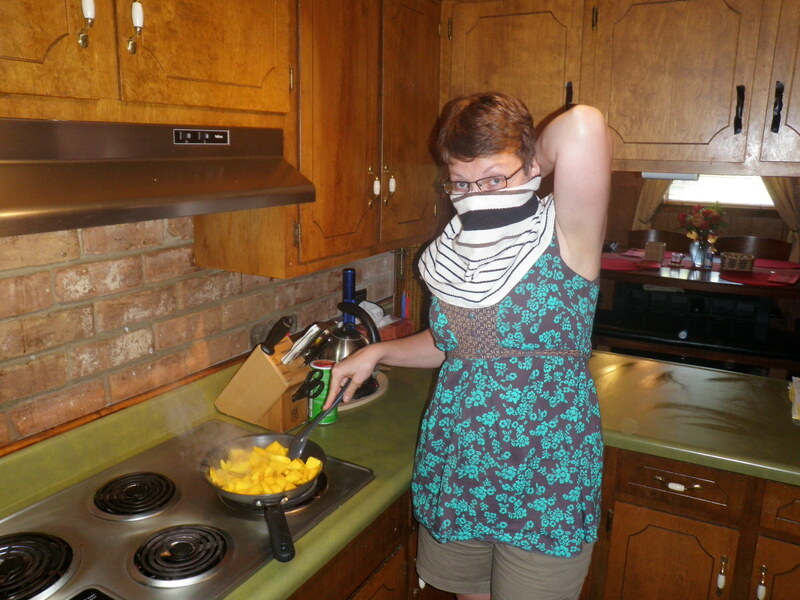 You can always become a kitchen ninja like I did. Once browned add the vinegar to deglaze the pan. Scrape the bottom to get all the awesomeness off the pan. 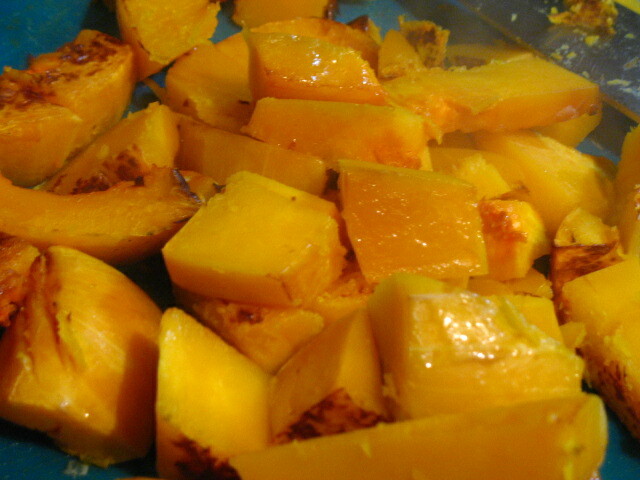 Put the mango/pepper mix in a food processor, add the lemon zest and juice. Blend until smooth. 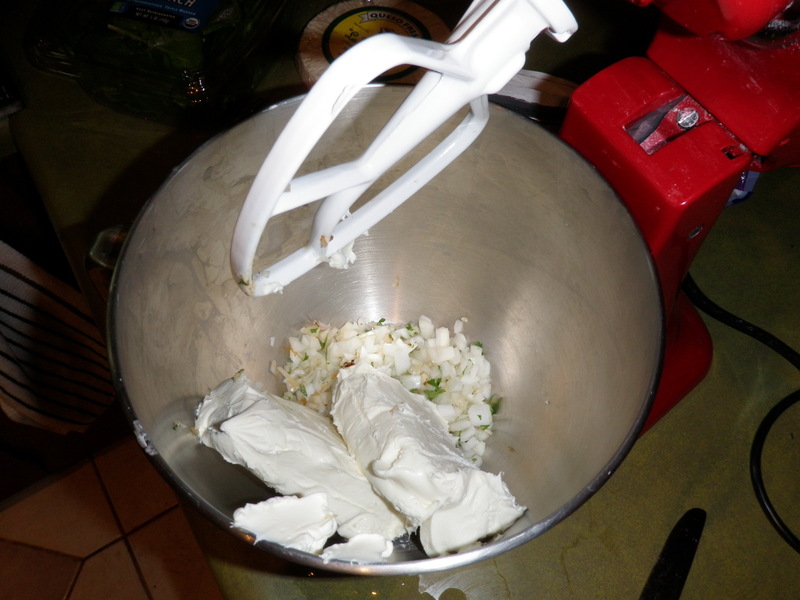 Refrigerate the sauce with the creme until ready to use. When you are ready to use it heat it through in a pan on med low heat. When you are ready for dessert carefully flip over the creme on a plate. Spoon the sauce on top. We ate ours with some fry bread dusted with powdered sugar. Orange soup! For the Eating the Rainbow challenge I made orange soup. I think I had more fun planning and cooking this soup than I have had in a long time. Of course tomorrow is my birthday party so everything seems awesome right now! This soup is rich and beautiful. I wish it were more like fall outside to properly enjoy such a warm and goregous soup. 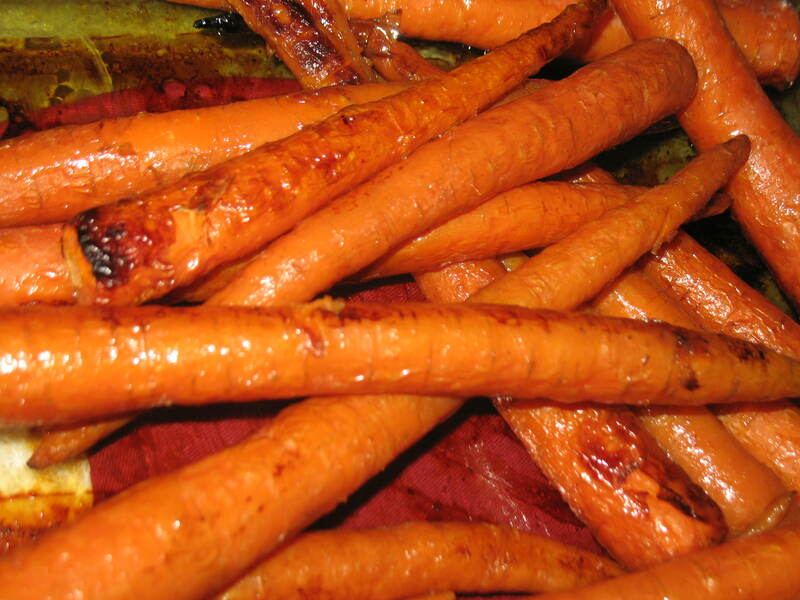 I roasted all the vegetables first to bring out their natural sugars. 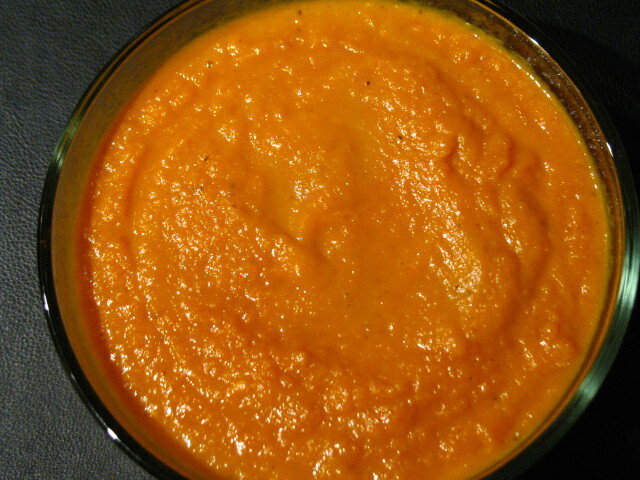 This soup is so orange and chock full of beta carotene that i’m sure i won’t need glasses tomorrow. 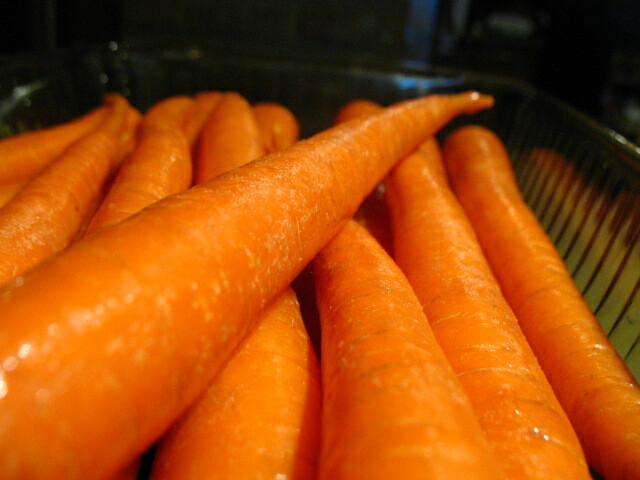 Trim the green end off of all the carrots and roast them in a pan at 400 with some olive oil until you see the edges browning. 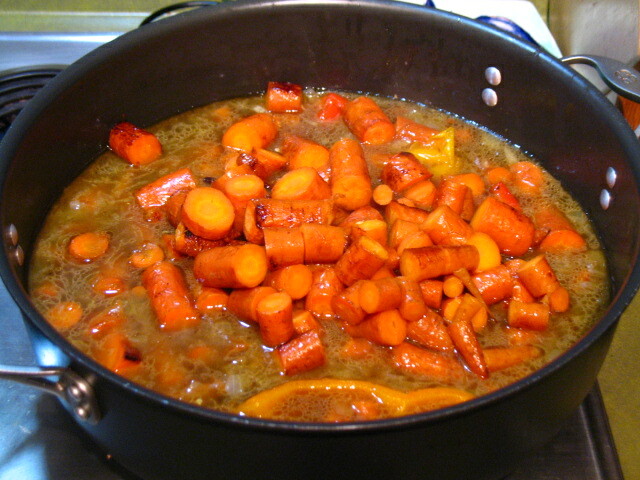 the carrots take about 20minutes. Roast the peppers, squash, and garlic the same way. If your oven is bigger you can do more than one at a time. I have a pretty small oven so I had to do all this in rotation. Squash and garlic 20min, peppers 10min. Forgot the after shot. but these are so pretty and bright! While you are waiting on the roasting to finish melt a stick of butter in a large, deep pan. 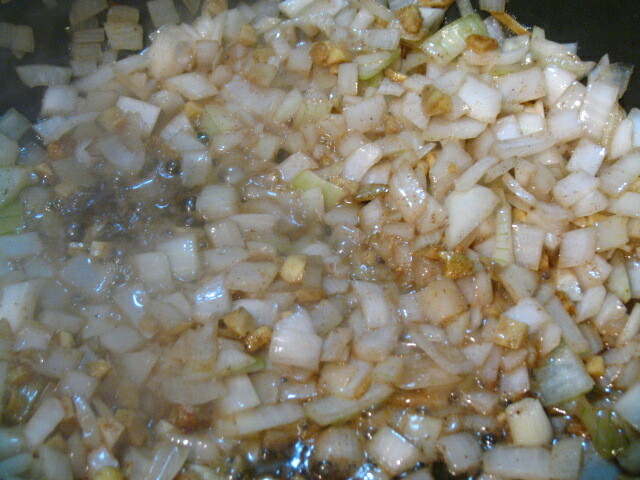 Brown the butter and then add the onion and ginger to the pan. 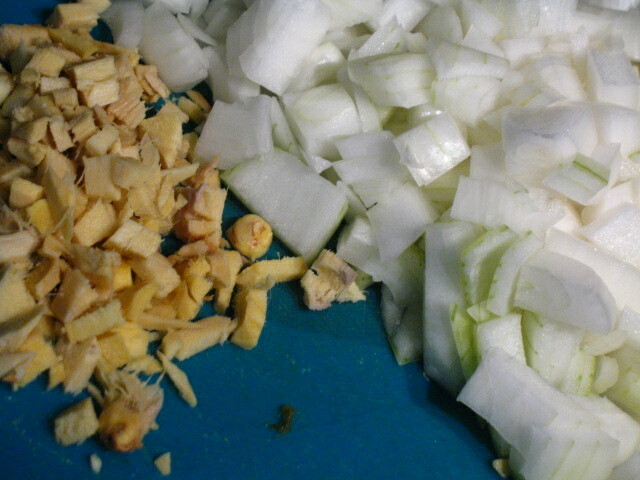 Cook on medium high until the onion is clear. Pour the chicken stock on top of the onion and ginger. Add coriander, salt and pepper and bring pot down to medium heat. Add all the roasted vegetables to the stock. Simmer on medium for about 20-30 minutes. 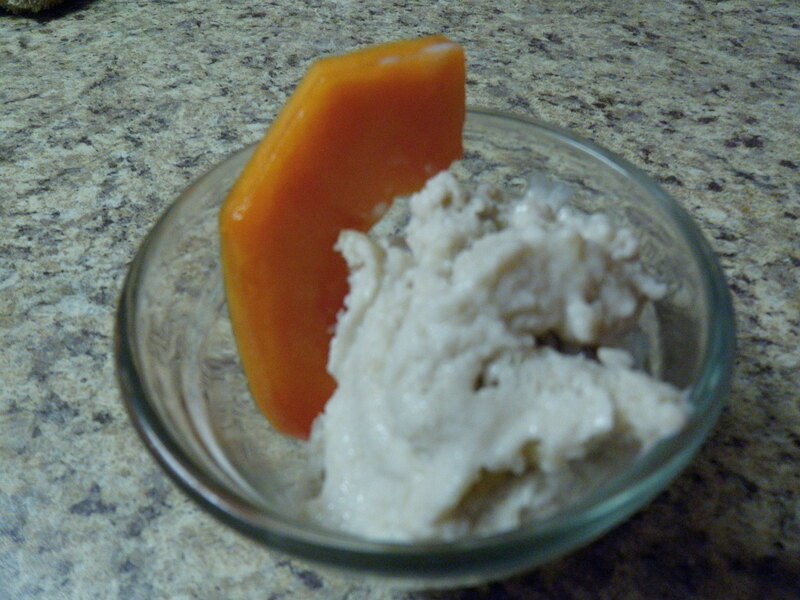 Cool for a bit and process in a food processor or blender. Let this sit over night and then serve. My coworker had the marvelous idea of some bacon bits on top. I will make sure to implement that idea promptly. Thanks Pam.